1. The gods had lost their authority over the demons after the sage Saga gave Indra a flower garland, which he recklessly gave to his elephant, who trampled it. Vishnu advised them to mix the milk ocean (Kshirsagar) with medicine and to stir him (Samudramathana ) and so produce Amrita, which would make them strong and immortal. They should use mount Mandara (Meru) as a stir bar. 2. On Vishnu's advice, they tied the serpent Vasuki (also the name of the multi-headed king of the Nagas) around the mountain and started to pull the Snake - the gods on one side and the demons on the other side. Vasuki is also depicted as hanging around Shiva's neck. As the milk ocean swirled around, the world mountain Mandara (or meru) was used as a stirring stick, which began to sink to the bottom of the ocean. Therefore, Vishnu took the form of the turtle avatar Kurma, the lower half of which was a turtle armor, and dived to the bottom where his back became an axis for the buttery stick. He told the gods to ask the Asuras for help with the return of a portion of the nectar that would result from the churning. 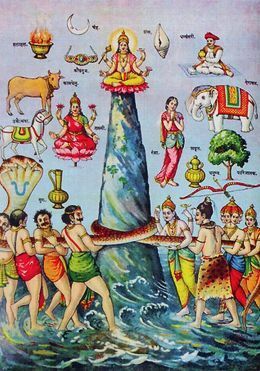 The gods and demons were then churning the ocean using the serpent Vasuki as a stirring stick. At the beginning, Indra plays a Machiavellian trick and asks the Asuras for the head of Vasuki. But the Asuras had the suspicion of a lazy game and took the head of Vasuki, whose poison slowly weakened them. The serpent spits out the blue poison Halahala that paralyzes and blinds gods and asuras. 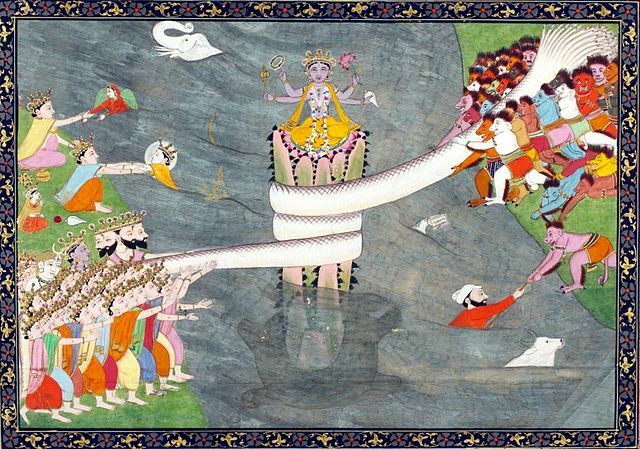 As the churn progressed, the mountain sank, and Vishnu in the shape of the turtle Kurma held the mountain above water. Once the bowl of Amrita, the nectar of immortality, was out, the Asuras grabbed it. While stirring, the ocean also produced other objects : Sura or Varuni - deity of wine; Apsaras - divine nymphs; Kaustubha - the most precious jewel in the world; Uchhaishravas - the divine white horse ; Kalpavriksha - wish-fulfilling tree; Kamadhenu - the wish-fulfilling cow, Airavata - the white elephant, and Lakshmi. In a more shivaistic version, a blue poison (which took Shiva in the mouth without swallowing it - hence Shiva's name Nilakantha) and then 14 Ratnas (jewels) were first produced while stirring : 'Chandra' (Moon): 'Parijat 'a tree in the paradise of Indra; Airavat, an elephant equipped with many teeth for Indra; 'Kamadhenu', a wishfulfilling cow; 'Uchchaihsravas' the white horse for Indra; 'Sankha', the scoop of Vishnu; gada; Laxmi, goddess of wealth; 'Rambha', Apsara (heavenly beauty) for heaven; Ratnas, (gems and jewels); Kalpavriksha, wish-fulfilling tree; Dhanwantari, the doctor for all gods; Mada, a deity; 'Amrit' (the immortality nectar) in a golden bowl (Kumbha). Then Vishnu took the form of Mohini, a beautiful maiden, and seduced the Asuras to have them distribute the potion and also to change the order of distribution. As soon as the gods were served, Mohini disappeared and the Asuras were cheated and totally weak. 4. (U.path 12.1) RAHU : Taking advantage of the demons' bewilderment, the Daitya Rahu, the son of Viprachitta (Demon of Heaven) and grandson of the great sage Kashyapa, disguised himself as God and drank of the elixir. The sun and the moon (the sun god Surya and the moon god Chandra) discovered the impostor Rahu and told it Vishnu. Just as Rahu swallowed the Amrita, Vishnu cut off Rahu 's head with his sun-shining Sudrashan chakra ('beautiful disc'). Since the Amrita had already passed through the neck, the head was immortal and remained alive. As the sun and the moon were responsible for the report of of Rahu's misdeeds, Rahu, the head, chases the sun and the moon across the sky and tries to eat them. Sometimes he catches and swallows either and causes an Eclipse. But the victim quickly falls out of Rahu's throat and the Eclipse ends. Rahu's Daitya counterpart is Ketu (Bright, Torch, Light), the hull. The lamaistic mythology is based on the indian concept of the ocean churning with the following legend (see Schlagintweit 115 ) of Chakdor (P c yag-rdor): The gods in the deva-heaven had once with great difficulty the elixir of life bDud-rtsi (Amrta ) procured from the bottom of the ocean, sealed it in a precious urn (Rin-c c-en-bum-pa) and handed it over to Vajrapani (Chakdor) for safekeeping. However, the Da'mon Rahu (sGra-can, Dachan) used Vajrapani's absence for a moment to drink off the life elixir and refill the bumpa with his urine. Then he quickly took flight. Alerted by the sudden evil smell in the sky, the gods soon discovered the wrongdoing. Vajrapani had to drink the urine of Rahu as punishment for his negligence on decision of the gods. Angered, he set out to persecute the Rahu. He learned from the sun and moon the direction the fleeing demon had taken. After he had caught him, he terribly wounded him with his Vajra. The wounds of Rahu, however, healed immediately, as he had drunk the elixir of life. From an allegorical point of view, the above four sections can be interpreted as steps 10 -12 of the 22 steps of the universal path. Section 9.2 begins with the earth element principle ie. (Elephant tramples the delicate flower). Tarot Card 11  shows the 'maiden' with the tamed lion of the lower self. Tarot card 12  shows the still untransformed chela between the pillars of the lunar and solar forces.